A dog is man’s best friend, so it is important that we look after the health of our four-legged friends. Fleas are one of the most common pest issues that dog owners face. Drawn to the warm furry coat your pet provides, these blood sucking vampires can prove challenging to get rid of. 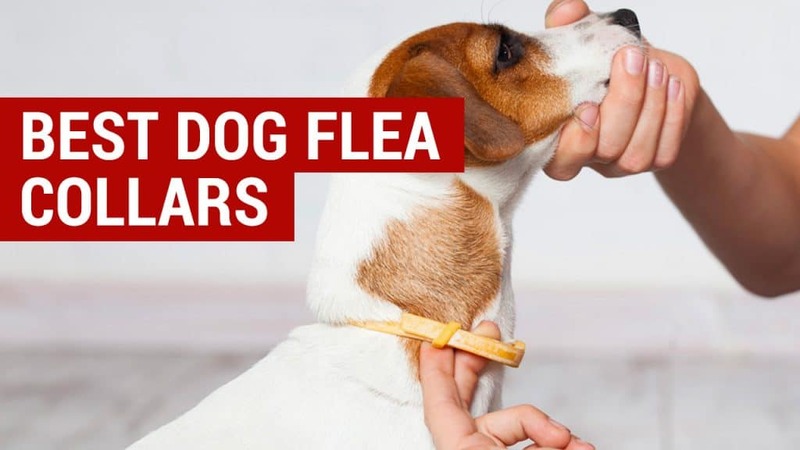 But before you even notice those first signs of scratching and get into a flea frenzy, make sure that you are one step ahead by investing in a preventative solution such as a dog flea collar. I would always advise that you take precautions in the form of a flea collar to prevent your dog from receiving unwanted visitors. 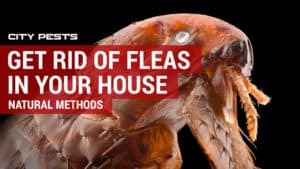 Although the safety of flea collars continues to be a hotly debated topic, there is no denying, that when used correctly and handled with care, they offer one of the easiest solutions for repelling, and in some cases eliminating, fleas. There are so many different brands of dog flea collars readily available on the market that understanding which one is right for you and your pet can often seem overwhelming. As someone who has regularly used flea collars on both my own and client pets, I have listed below my top reviews and recommendations. 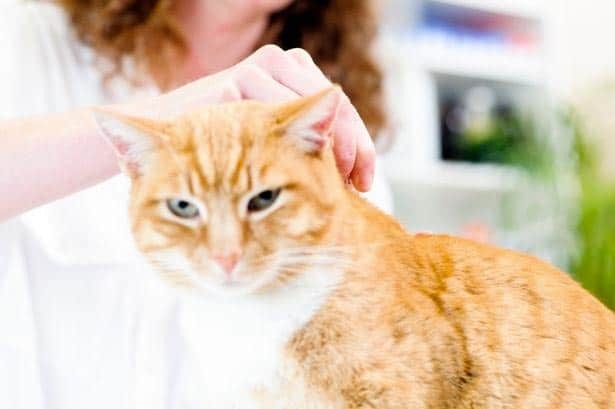 I would, however, always advise that you consult with your own family vet regarding which one to purchase and use it as part of an overall flea prevention treatment plan, rather than to tackle an existing infestation. Not all dogs will be suitable for wearing a flea collar. For example, if your dog is elderly, pregnant or nursing puppies then you would need to use alternative methods. If you have a puppy it is not recommended that they wear a flea collar until they are over the age of 6 months. If you have children in the house or are pregnant yourself, then again, I would advise against using flea collars altogether as a form of treatment, or at the very least only purchase a natural flea collar made without using chemical pesticides. Ingredients. As stated above, not all dog flea collars are infused with chemical pesticides, with many now offering a natural alternative in the form of essential or plant based oils and ultrasonic sound waves. I talk more about this below (add in link). Water-resistance. Most dogs enjoy running in and out of muddy puddles, lakes and ponds, and are therefore unlikely to remain dry, all of the time. If your dog is a water baby or regularly needs bathing, I would suggest purchasing a water-resistant collar to increase its longevity. Size and adjustability. Dogs come in all shapes and sizes and so it is important that you choose a flea collar to suit your breed. Often dog flea collars come in a variety of small, medium and large but if you are in any doubt, you should measure the circumference of your dog’s neck with a measuring tape. If you have a particularly large dog, then I would recommend using a drop on treatment or a flea shampoo instead of a collar, as trying to maintain fleas across a large body area if often not possible just by using a flea collar alone. Most flea collars come provided with an adjustable collar and buckle, whilst others may require you to cut and fit it to suit. Some are not adjustable at all, so make sure you read the instructions before purchasing. Length of Protection. It should state on the packaging how long your chosen flea collar will protect your pooch for, but on average it tends to vary between three and eight months. I would advise that you keep a note of when a new collar is required so that you can ensure your pet is kept flea free. There are two main types of dog flea collars on the market. Chemical infused dog flea collars – the effectiveness of these collars vary depending on the insecticides used but are designed to manage and maintain fleas in all stages of their life cycle including larvae and eggs. Worn around the dog’s neck the pesticides get released slowly into the dog’s hair and skin, killing fleas as they encounter it. Natural dog flea collars – these collars are made up of organic ingredients and essential oils such as lavender, cinnamon and eucalyptus which are thought to ward off fleas. 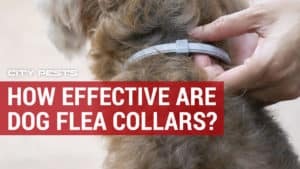 Although this dog flea collar is anything but cheap, the expensive price tag is more than made up for in its effectiveness to banishing fleas and protecting your dog. 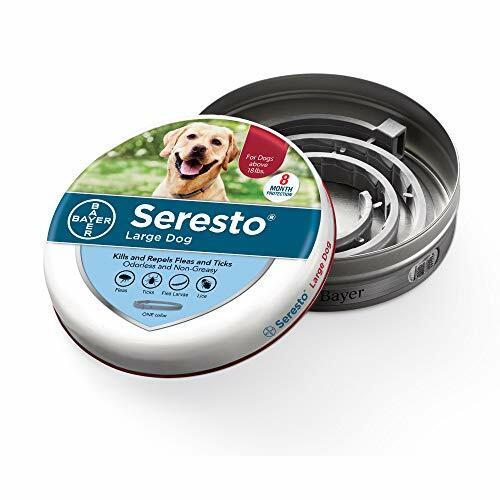 Not only am I a massive fan of the Bayer Seresto dog flea collar but is the number 1 flea collar recommended by vets. These collars contain an insecticide that is released slowly, ensuring that it is diluted when distributed throughout your dog’s fur. The flea dies on impact when coming into contact with the dog’s skin and what’s great about this collar, is that it kills off eggs and larvae too. However, what makes this collar such a winner for me, is that it is odourless and grease free – leaving you free to snuggle up to your four-legged friend without a whiff of toxins or left-over smear. This is the one of the most inexpensive flea collars available, yet one of the most effective on the market. But be warned, its active ingredient tetrachlorvinphos (an organophosphate), is a pesticide used in agricultural products and has been known to cause toxic reactions in dogs, humans and other pets. However, whilst it is good to be cautious, it is also important to note that these cases are in the minority, with most owners experiencing great results. I would therefore recommend that if you purchase this product, that you keep a close eye on your pet. 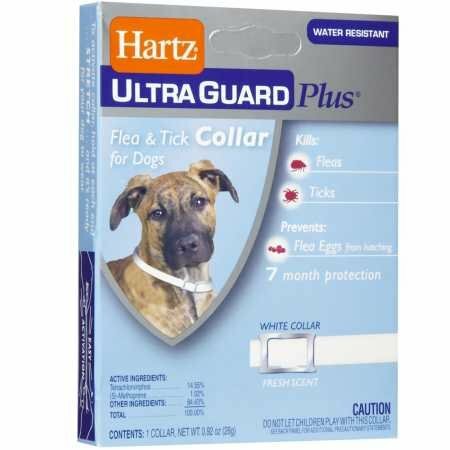 Similar to the Hartz Ultraguard, this flea collar by Adams includes the main ingredient tetrachlorvinphos, so I would recommend that you take precautions when applying it to your pet and keep a look out for any side effects your dog may experience. 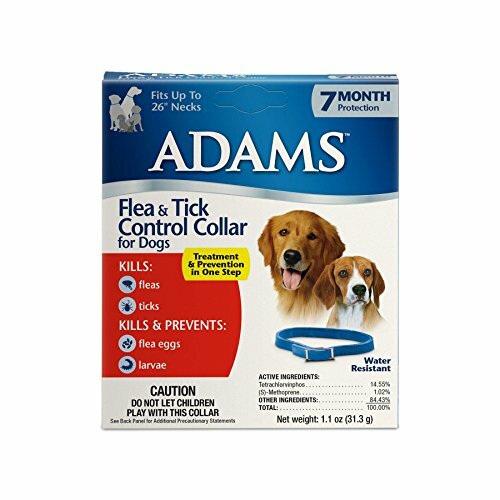 This flea collar comes with an adjustable strap and offers prevention for up to 7 months. It is water-resistant and great value for money. The Hopewell dog flea collar is one of the most innovative on the market. This one size fits all collar is infused with essential oils including cinnamon, eucalyptus, lemon and lavender to name but a few. Whether you have a large dog or a small pup, this collar has been designed to “snip to fit” your pet pooch and with up to 240 days protection (8 months) it offers great value for money. SAFE & EFFECTIVE: Our Natural Flea & Tick Collar will provide multi protection for your pet with its enhanced natural plant extracts thanks to a new composition of natural oils. It will help prevent fleas, ticks, lice, larvae, and mosquitoes from your furry pet more effectively. 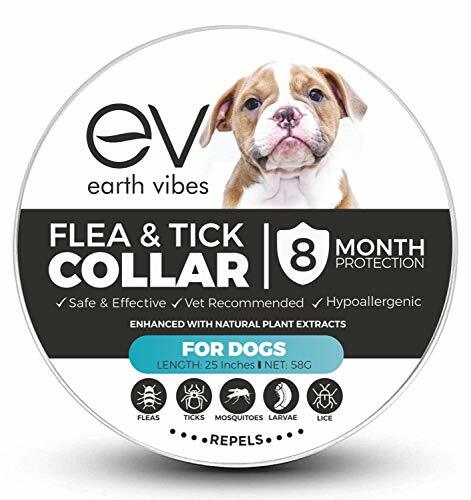 UP TO 8 MONTHS OF PROTECTION: Earth Vibes Flea & Tick Collar is an easy-to-use and non-greasy collar that repels fleas and ticks for up to 8 continuous months. VET RECOMMENDED: Our eco-friendly and natural formula helps ensure the safety and security of your cat and dog using non-harmful chemicals, making it the best Flea & Tick Pet Collar voted by customers and vets around you! ADJUSTABLE & WATER RESISTANT: Our pet collar is an adjustable strap to conveniently go around the neck of your pet. Excess length can be easily cut off. Our water-resistant technology allows your pet to have the freedom of playing in the water while wearing our Flea & Tick Collar. MAKING THE EARTH A BETTER PLACE: A portion of each and every sale at Earth Vibes is donated to children and families in need. It is our mission to make the earth a better place for everybody in it. We are dedicated to our families, our pets, and our community. This includes you, your family, and your pets too! The Earth Vibes dog flea collar provides protection for your pet against not only fleas but ticks, lice and mosquitoes too. Although it states it is made from natural and plant-based ingredients (so is hypoallergenic), it does also contain the chemical tetrachlorvinphos – so please be aware of this if you have a dog with sensitive skin. Like the Hopewell collar, it can be adjusted to fit any dog no matter how big or small and is water-resistant for when they fancy a splash around. It is not the cheapest collar on the market, but is another collar that comes highly recommended by vets and as a bonus, a proportion of each sale gets donated to charitable causes. 6 MONTH NATURAL PROTECTION AND PREVENTION- Use in conjunction with proper dog grooming, dog brushing, and dog or puppy shampoo for a VERY effective total pest bite prevention program. 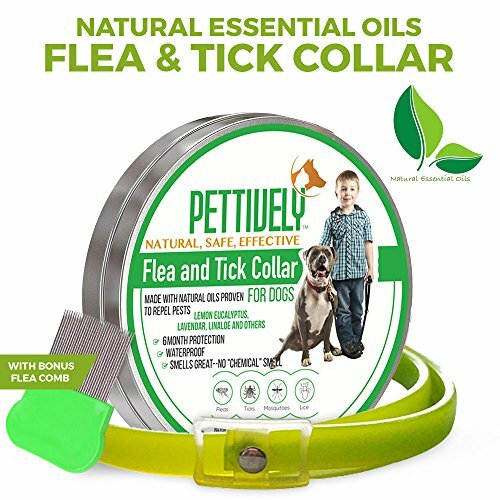 NOTE: If your dog already has fleas or tick issues, apply a flea and tick shampoo before applying the Pettively Flea Tick Mosquito Lice Repellent Collar for best results. 100% CHEMICAL FREE COLLAR-don't be fooled. Not all "natural" collars are 100% Essential Oil collars! Our vet-recommended natural pest repellent dog collars contains no toxic chemicals, only our proprietary essential oil blend. WE ALL WANT WHAT'S BEST FOR OUR DOGS AND OUR FAMILIES! 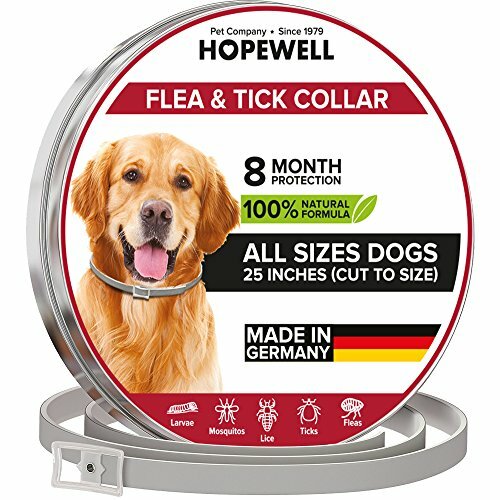 Our Pettively 100% Natural Flea, Tick, Mosquito, and Lice repellent collar for dogs can protect your pet from pests that bite and cause disease. Safe for homes, furniture, kids, and pets. Hypoallergenic collars utilize natural repellents shown in studies to reduce and eliminate pest attacks. Greatly reduce the risk of infestation inside the house with no dog allergies, no chemicals, and a pleasant smell that dissipates in just a few days. WATERPROOF ADJUSTABLE COLLAR allows it to remain effective through rain, swimming, and bath time. Use the free dog flea comb to give your dog a periodic checkup, which may be an indicator it's time to replace your collar. Easily adjustable Collar fits puppy, small, medium and large dog sizes. 100% SATISFACTION GUARANTEED! Save time, frustration, and money without flea pills, heartworm medicine, flea bombs, flea powders, flea tick sprays, or mosquito repellents for dogs inside the house! See the description below for more about how good grooming habits and an effective pest treatment and prevention program can help your family and your pets. If you're not satisfied we refund or replace, no questions asked! This flea collar offers you all the protection your pet could need whilst being eco-friendly, water-resistant and odour free. At first glance this collar appears to be more expensive than others available on the market, but Pettively offer a satisfaction guarantee promise, which means that is you are unhappy with the product you can receive your money back. I have used this make of collar many a time and have always been impressed with its success rate. The only gripe I have, is that the length of protection is only 6 months at a time. The device emits ultrasonic pulses that are imperceptible to humans and pets, but interfere with the ability of the parasites to orient themselves, thus keeping them away from your Pet. 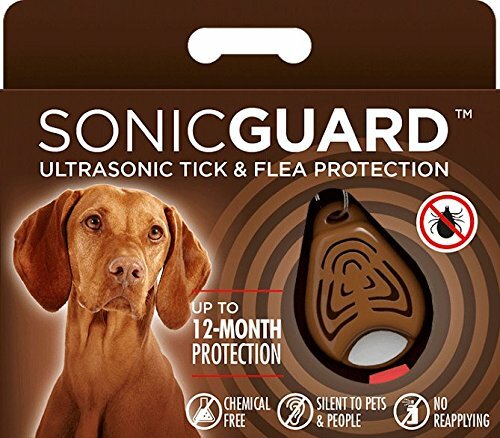 The SonicGuard collar is a small electronic device, that comes in a variety of colors including pink, white, red, black or brown. These small pendants attach to your dog’s collar and emit a series of ultrasonic sound waves that are harmless to humans and pets but that claim to disturb and repel fleas. I am still highly sceptical of these types of collars but appreciate the need to look for non-toxic solutions when treating animals. The battery life is relatively long lasting and should see you through 10-12 months of protection. The fact that this collar is odourless and water-proof is another reason to give it a try. Use drop on flea drops for your cat and not a flea collar. Can I use a dog collar on my cat? One of the most popular questions that I get asked on a regular basis is, “can a dog flea collar be used on a cat?”. The answer to this is most definitely not. These two types of collars are not interchangeable and although the cynic in me may once have questioned whether cat and dog collars are produced separately purely for marketing purposes, research and knowledge has shown that they are manufactured based on absorbability. The amount of toxins that a dog can absorb is far greater than that of a cat. This is because cats are, in the main, much smaller animals and therefore their bodies are not as efficient at breaking down chemicals at the rate in which a dog can. Therefore, if you were to use a dog collar on a cat it could cause them serious harm. 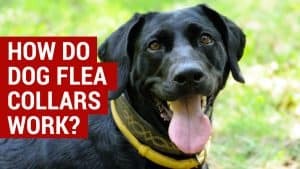 Whilst I am an advocate for dogs wearing flea collars, it is important that you are aware of all the options should a flea collar not be a viable preventative method for your pet. Below I have listed the most popular do it yourself flea remedies available today. Also known as “spot ons”, this form of medicine works just as its name suggests. Applied between the shoulder blades of the dog, small drops of medicine penetrate deep into your pet’s skin and disperses throughout the body via the sweat glands. Containing ingredients like those found in a flea collar, drop on’s work by repelling and killing fleas once they encounter it. Oral medication offers the same protection against fleas as a collar would, but often come with fewer reported side effects. Although pills can bought online, it is always best to check with your vet before purchasing as they can offer advice on the best type of oral medication for your dog. Flea sprays and powders offer a cheap alternative to other dog flea treatments and can last for several months providing your dog remains dry. Failure to do so will result in the spray washing off and the fleas invading once more. If your dog will tolerate a thorough clean, then bathing with a flea shampoo is a good option. These shampoos contain pesticides that can tackle both the fleas themselves and any eggs and larvae and offers protection for up to 28 days. Aside from the pesticide free and ultrasonic collars, there are many myths surrounding dog fleas and the best way to tackle them without using harmful ingredients. I personally believe that these ‘old wives’ tales will be unable to tackle an infestation on their own, however, when combined with other methods may offer additional benefits. Many of these solutions are cheap and simple to setup. For example, why not try bathing your dog in lemon juice, which is a key ingredient often found in pesticide free collars. Thought to dry out and dehydrate fleas, even if it doesn’t work at least you’ll be left with a fresh smelling doggy. Another thing to try is to vacuum the fleas up. Just like bed bugs, fleas hate extreme heat and therefore a regular deep clean of all your carpets and soft furnishings with a specially designed vacuum or steamer could see you dog flea free over time. Finally, why not invest in some pungent pot plants? Many dog shampoos, powders and collars use essential oils with plant-based ingredients, so by adding chrysanthemums, lavender and eucalyptus around the home will not only create a sweet smelling environment but could even start to repel fleas. Finally, why not take a look at what your dog eats and look to include a small amount of garlic. If it keeps vampires away, who’s to say it won’t have the same desired effect on these blood sucking pests? This is not recommended for cats, but a small amount, concealed within your dog’s normal feed is perfectly safe. You may be interested in: How to Get Rid of Bed Bugs on Dogs – Can they live on dogs? So to round up, here are my thoughts and opinions on dog flea collars. When used safely I believe that pesticide collars are the most effective solution at combating fleas despite recent press reports. However, you should always consult with your own vet beforehand, follow the instructions given on the product packaging and check your pet regularly for any signs of known side effects. 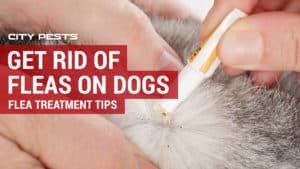 I would always recommend that you use a combination of flea control solutions, as some are better for preventing fleas rather than tackling a current infestation. Although my stand out collar of choice is the Bayer Seresto (a pricier product) its reputation proceeds it in terms of results. If you don’t mind spending the money and are looking for a chemical free alternative, then why not try an ultrasonic collar, but be aware that these have yet to be backed by any conclusive research. Welcome to CityPests.com. We are intended as a guide and resource to learning to do your own pest control. 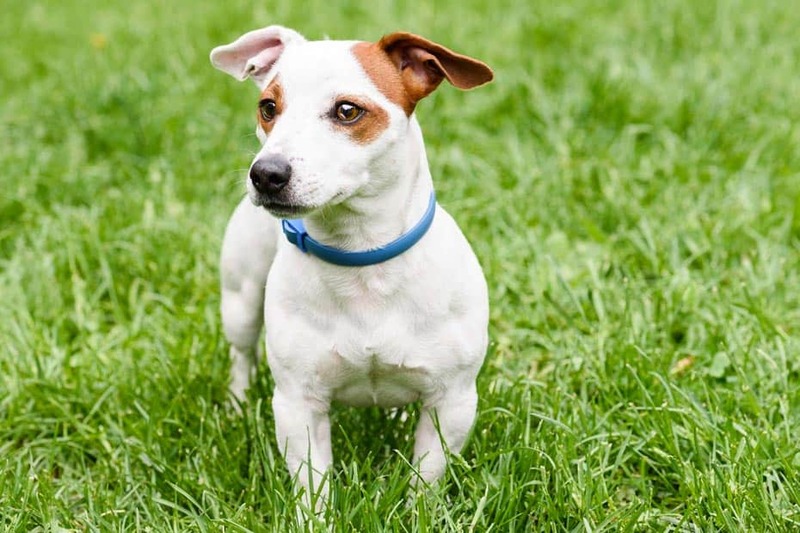 How Effective Are Dog Flea Collars? How do dog flea collars work? CityPests.com is a participant in the Amazon Services LLC Associates Program, an affiliate advertising program designed to provide a means for sites to earn advertising fees by advertising and linking to Amazon.com.